Step right up to this amazing circus theme party bursting with bright colors, desserts, decor, and more! 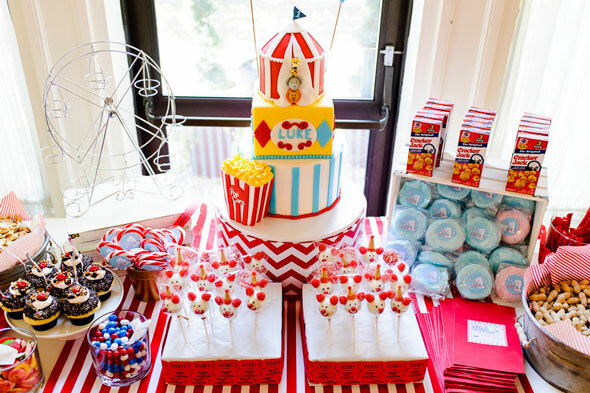 If you’re on the hunt for first birthday party ideas, a circus theme party is perfect! 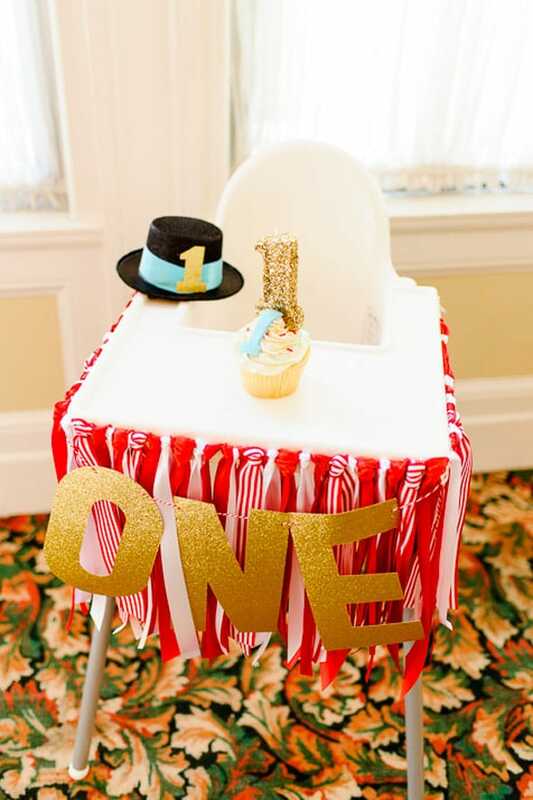 This fun, colorful theme is a great way to celebrate your baby’s first birthday! 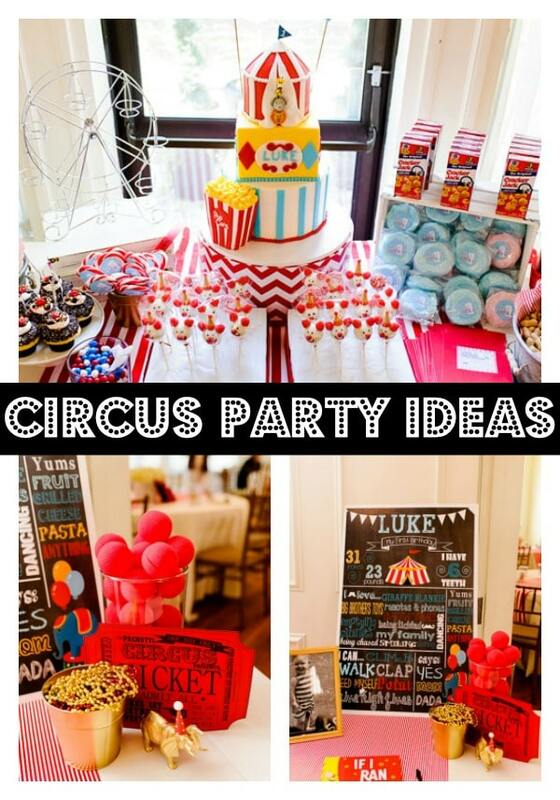 There are some great circus theme party ideas in this party that you can easily incorporate into your circus party. To create the best circus theme party, first start with the basics: a fun circus theme cake like the one in this party, circus food and desserts, and circus games and activities for the children like a magician, face painting, ball toss, etc. Next, focus on the circus party supplies and decorations. 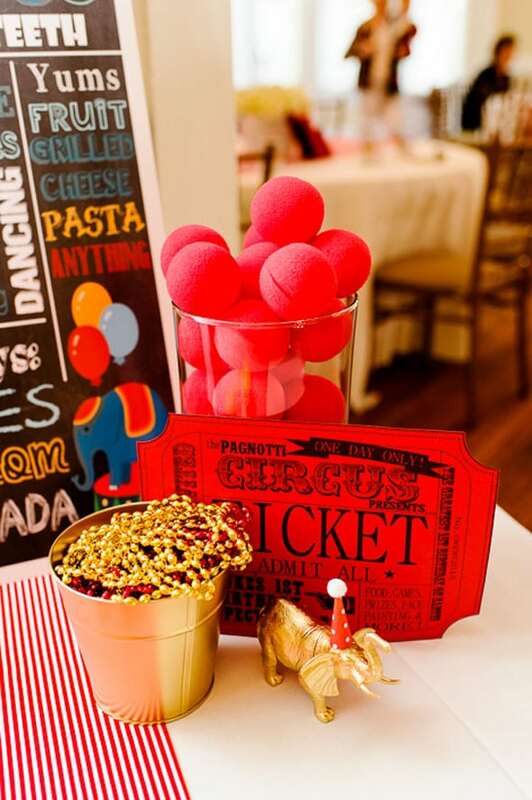 Incorporate red, blue, yellow and white for a fun and colorful circus theme party! Add big gold balloons, signs, tickets, etc. 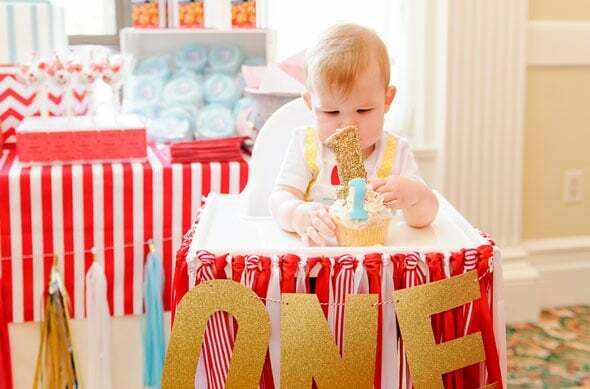 Now, let’s get to all of the fun party details in this Circus Themed First Birthday Party. 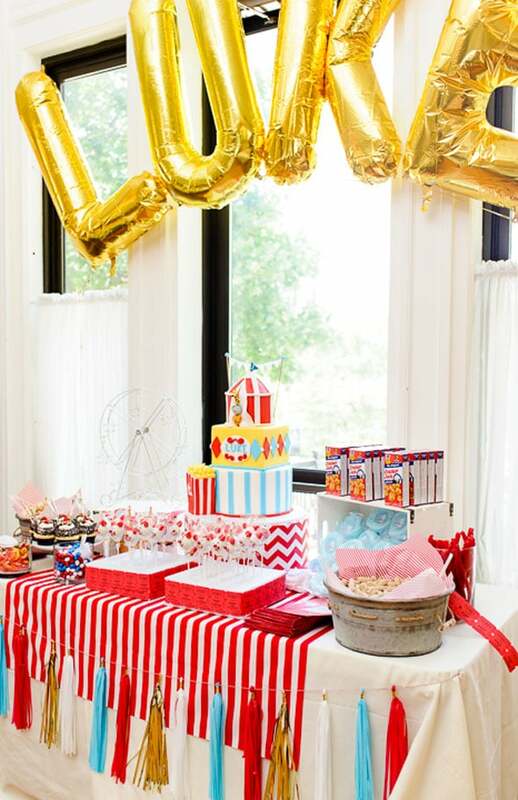 This circus theme party turned out absolutely magical and every little detail was thought of by Mom, who pulled one heck of a DIY party together! This mom loves anything and everything that has to do with DIY and this circus theme party showcased that talent to the max!!! 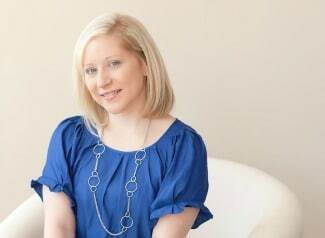 She loves to be inspired by and recreate amazing ideas that she finds on Pinterest and this party proved that she definitely has the chops to put an amazing first birthday party together for her little man! 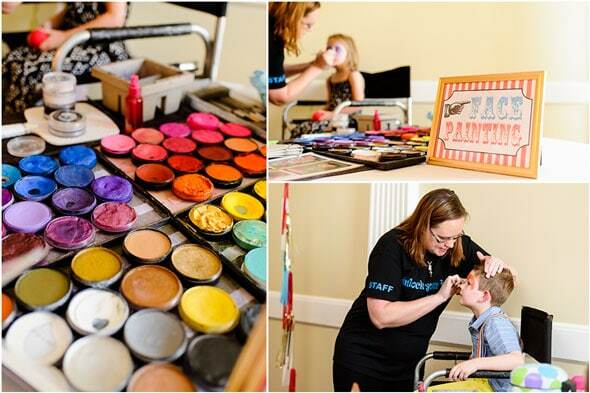 The party was held at Posh at the Scranton Club and it was a perfect venue to hold this adorable birthday party! The space was open for all of the little ones to be free and it was set up perfectly with different games, food, desserts, and fun for all of the little ones to experience. 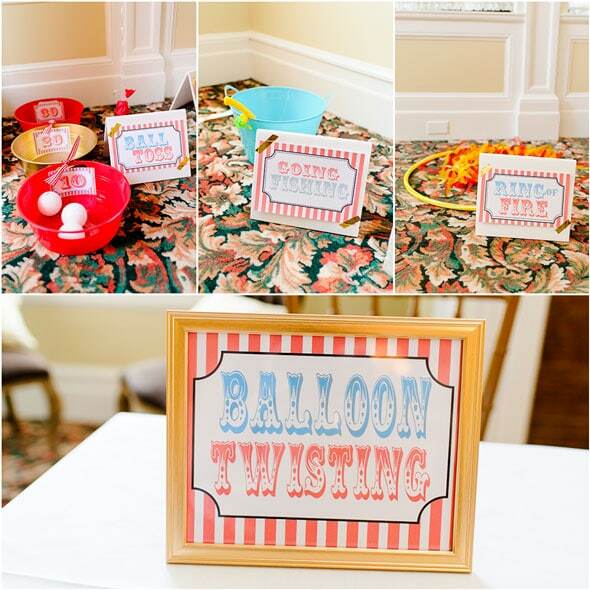 Pictures were taken by Crystal Satriano Photography and she did a great job capturing all of the wonderful aspects and details of this circus theme party! 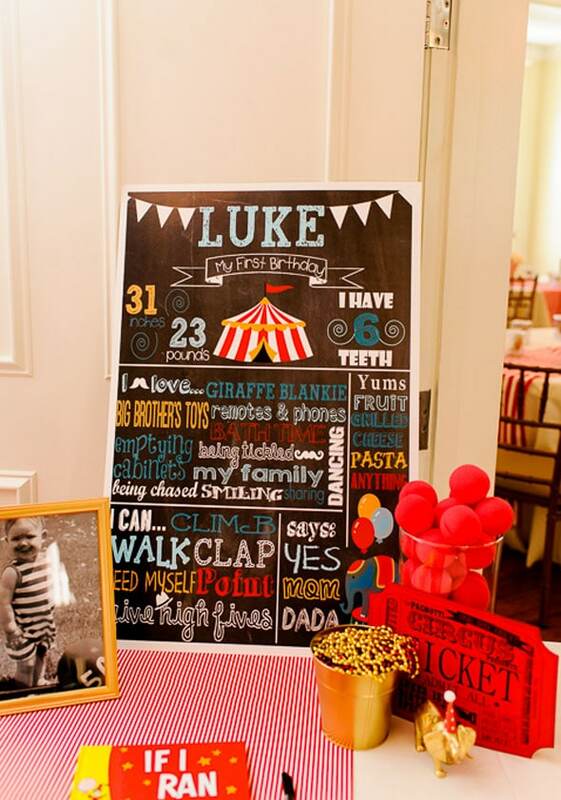 You can’t have a 1st birthday without a popular customized chalkboard sign with all of the birthday boy’s information! We love this sign that was used as part of the circus decorations, along with the circus tickets, and red circus clown noses! 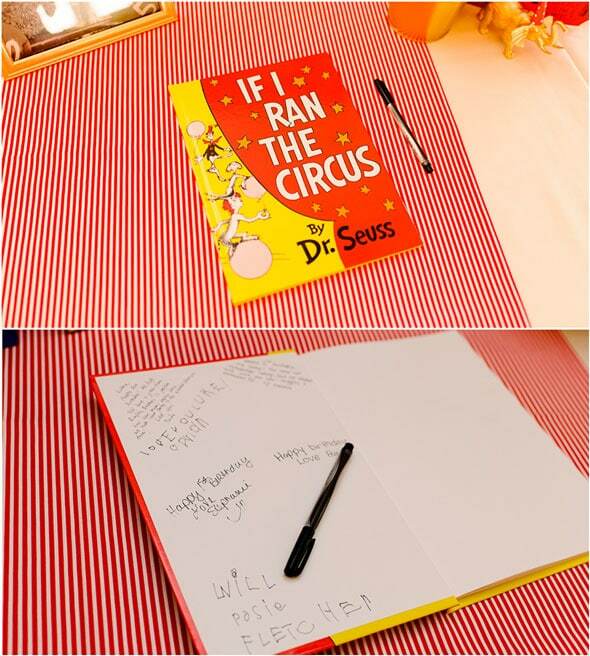 Mom had a great idea to incorporate a circus book by Dr. Seuss for guests to sign. What a sweet idea. It will make the perfect forever keepsake for the adorable birthday boy! Starting with the welcome table when all of the guests walked in, she created one beautiful arrangement from the tassel garland overlay, to the cute idea of leaving a circus-themed book, “If I Ran the Circus” by Dr. Seuss, out for everyone to sign as they arrived. What a great keepsake to look at for years to come! A cute milestone board with all of the birthday boy’s 1-year stats was provided by MJN Doodles, which was perfect! The “Pagnotti Circus” ticket was designed by mom on her home computer and printed out on red textured cardstock. How darling! 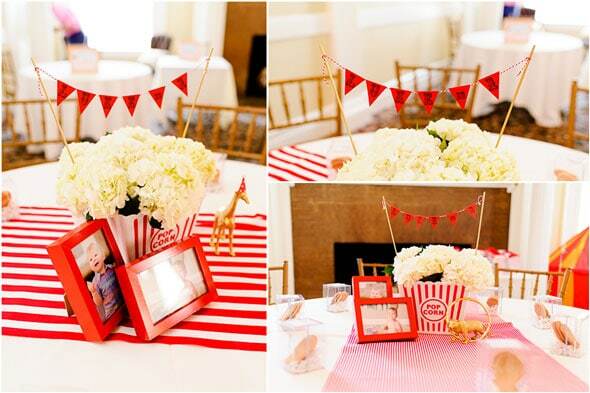 The circus centerpieces at all of the tables were also a gorgeous DIY project by mom! We just can’t get over how talented she is! Mom purchased the plastic popcorn buckets and arranged fresh hydrangeas in them with sweet pictures of the birthday boy flanking the sides of the buckets. The mini pennant banners with the birthday boy’s name were also created by mom on her computer and printed off on red textured cardstock. She put them together with bakers twine and spray-painted wooden skewers, and BAM! The pennants turned out amazing and were such a cute detail to add to the circus centerpieces! Even all of the little circus animals around the centerpieces had finishing touches by mom. After she purchased them, she spray painted them with metallic brass Rustoleum and made little party hats and hoops herself. 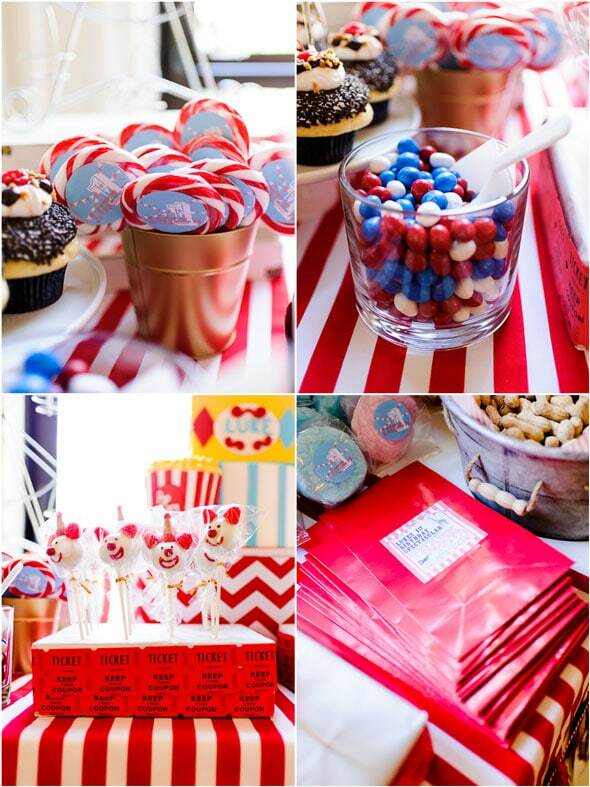 What cute little accessories for this sweet circus theme party! 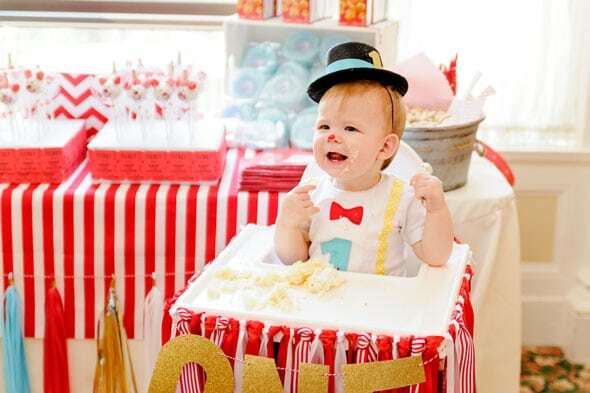 The cute little birthday boy had the most AMAZING little circus-themed outfit ever! How adorable! There was ringmaster coat and shirt, which were created by Fab Tutus And More and the hat was made by mom with a hat that she originally purchased from Amazon. He looks like he’s really enjoying his circus theme party! You can’t have a circus theme party without some delicious funnel cake, right?! That is certainly a must-have for any circus party! 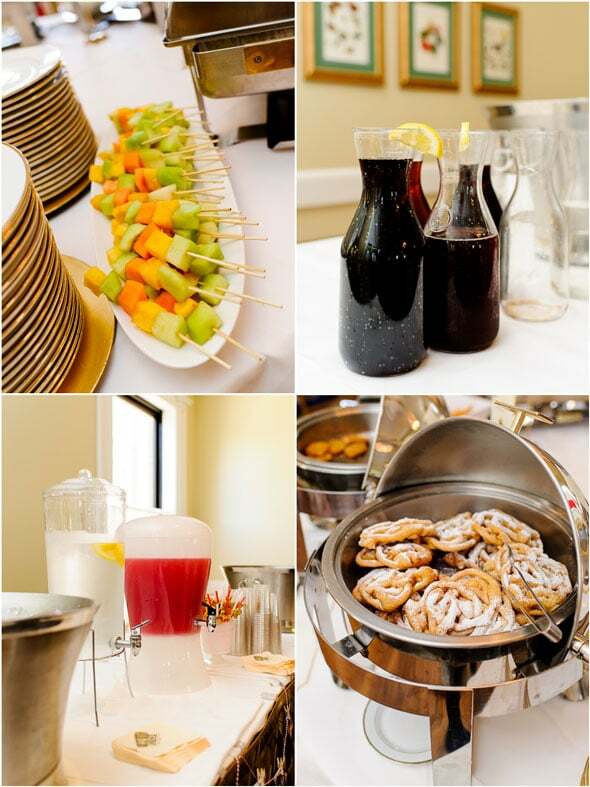 A variety of drinks were also served along with fresh fruit. 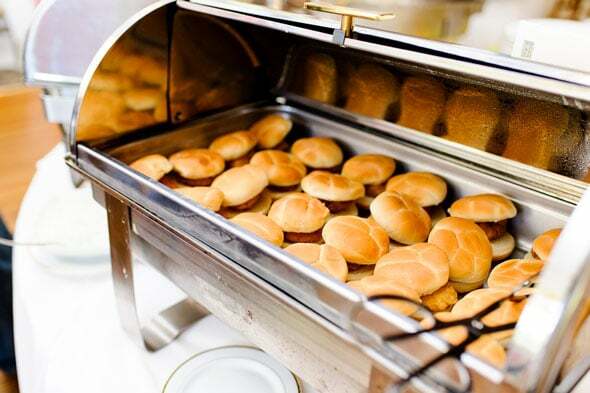 In addition to all of the circus desserts, guests were treated to an array of wonderful catering by the venue and nobody had an excuse for leaving hungry! Look at those mouth-watering burgers! YUM! But the dessert table really took the cake! A three-tier circus theme cake was created by Truly Scrumptious and it looks mouth-watering! Look at all of those amazing details! What a truly magnificent first birthday cake! Mom even made a great cake stand to go with it, which was a hat box that she blinged out to match the theme. Perfect! 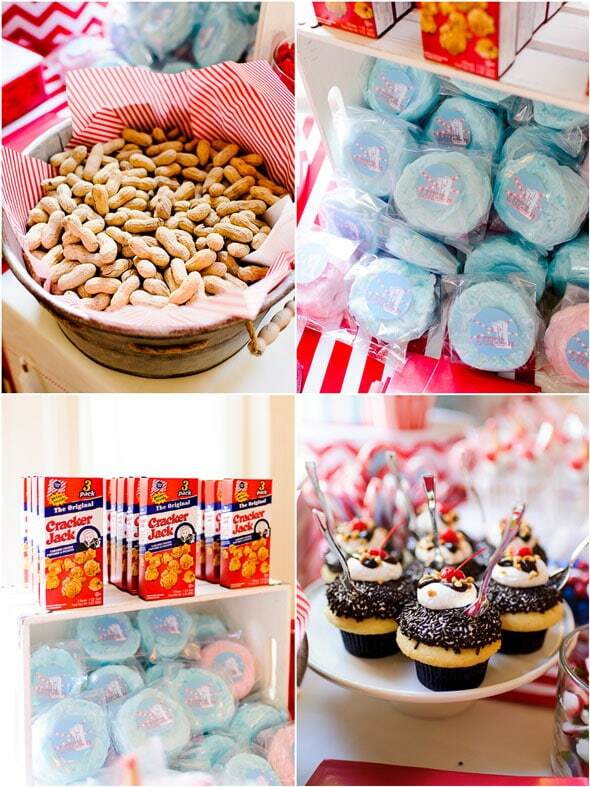 This circus theme party featured an array of mouth-watering desserts including cotton candy, sundae cupcakes, Cracker Jacks, peanuts, and cotton candy. Everyone’s sweet tooth was satisfied at this circus party! Look at all of these delicious-looking desserts! What a great tablescape! 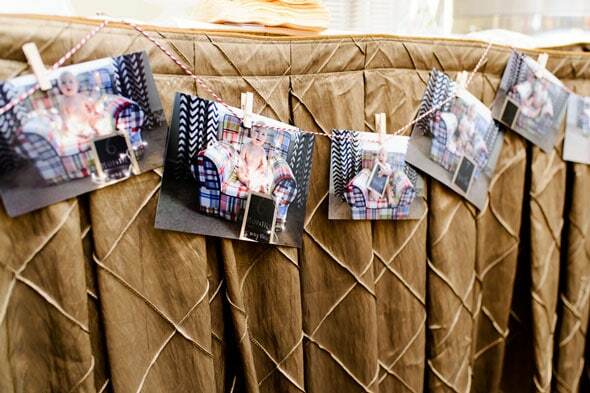 Of course, Mom did tons of DIY projects to make everything absolutely perfect! The striped table runners and overlays were, of course, made by mom with supplies she purchased from Hobby Lobby. The stickers that were found on the different things around the table were made by Mom, as was the dessert bags! So talented! The ADORABLE ice cream sundae cupcakes were provided by The Sweet Lush Cupcakery. I can’t even stand how perfectly adorable those cupcakes are! Of course, the cake pops were made by none other than Mom herself, which she found inspiration for HERE. She didn’t stop with the cake pops, though. She also created the cake pop stand from Styrofoam, which she covered with white tissue paper and wrapped with raffle tickets. WOW! All of the kids eventually got to take the dessert bags and fill them up to the brim with treats that they were able to take home and snack on later. 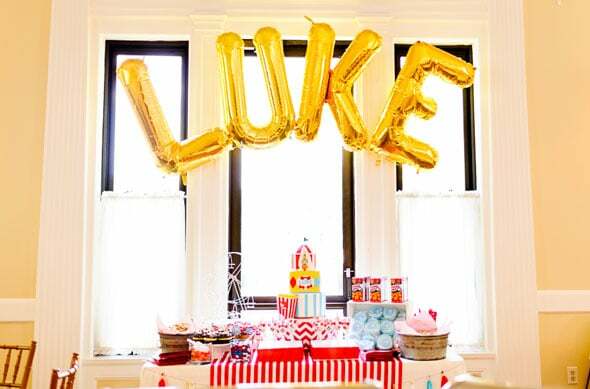 The birthday boy had his name spelled with large letter gold balloons that hung over the circus cake table. 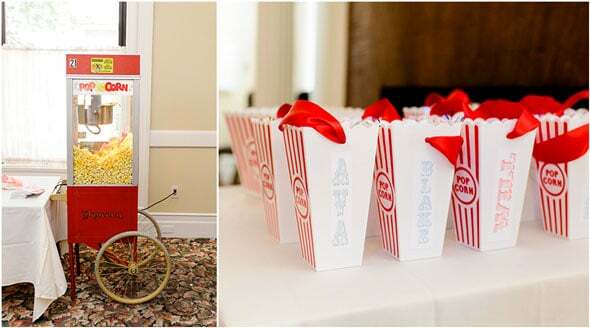 And what circus party would be complete without a popcorn machine, which was rented from Taylor Rental. Popcorn Boxes were on hand for guests to enjoy some yummy popcorn! Of course, every circus theme party has to have fun circus games and activities and this one definitely didn’t disappoint! All of the kids were treated to face painters from Just Plain Crazy Face Art and More, along with balloon artists from Lollipop Party Services. The “Hungry Hungry Lukey” game used photos taken by Crystal Satriano Photography, which mom had printed as an engineer print from Staples. She than attached it to two pieces of white foam board, purchased some fun foam noses, which then needed to be tossed through Lukey’s mouth into a red bucket. The kids loved it! They also got to play many other games like “Ring Of Fire,” “Ball Toss,” and “Going Fishing.” Mom created all of the signs herself on her home computer and put together all of the games with different things she purchased and had around the house. Amazing! Soon, it was the birthday boy’s turn to eat his special cupcake from Truly Scrumptious in his super cool high chair decked out by mom! The O-N-E banner was assembled by mom and cut out from gold glitter cardstock. She also created the glittery “1” candle that adorned the top of his cupcake by taking a candle that she purchased and mod podged it with gold glitter. How spectacular! 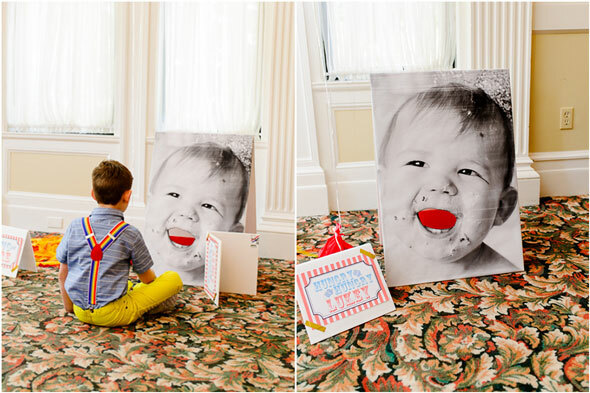 One of our favorite first birthday ideas is the photo banner assembled by mom with pictures taken throughout the birthday boy’s first year. She used bakers twine and mini clothespins and created a great detail that everyone enjoyed looking at during the circus theme party. 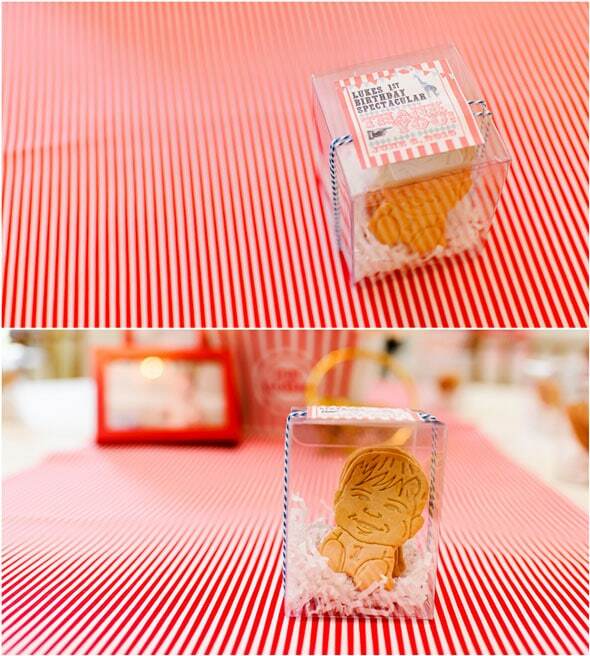 Everyone got to take home these sweet cookie favors, which were made by Parker’s Crazy Cookies. Seriously … how cute is that?! The labels on the clear boxes, which were purchased at Durapak Supplies, were made by mom on her home computer. She then decorated the boxes with white paper shred and blue bakers twine. What a great DIY project to end this spectacular circus theme party! This is one lucky little guy and we can’t wait to see how mom tops herself with his 2nd birthday next year! 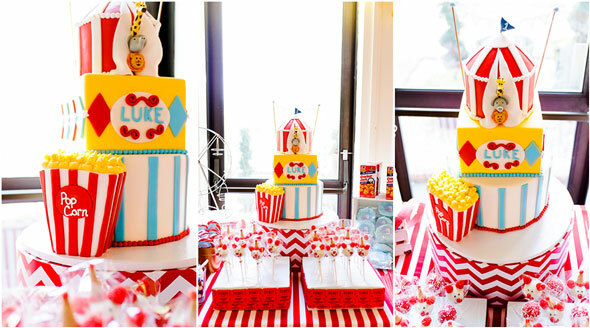 What’s your favorite detail in this Circus Themed First Birthday Party? Let us know in the comments below. For more 1st birthday party ideas, follow us on Instagram @prettymyparty and Pinterest and join us in our private Facebook group.